The Maillard reaction occurs when dry food is cooked at a high heat or for a long period of time. The reaction starts slowly at 250°F (121°C) and ramps up quickly as the meat fibers hit 350°F (177°C). But the Maillard reaction is about more than looks! The reaction changes the aroma and taste of food, too, by leveling up the umami experience. The result? Golden, brown, and delicious. Now, lest you think that we’re talking about caramelization here, the Maillard reaction is not the same thing as caramelization, which is the browning of sugar. When certain foods are heated, the natural sugars are broken down, turning brown and delivering a sweeter flavor known as caramel. A good example of where the two meet in the middle comes with onions: The browning comes from the Maillard reaction, and the resulting sweetness is thanks to caramelization. Humans have been cooking with the Maillard reaction since the dark ages—and beyond! But it wasn’t until French chemist Louis-Camille Maillard decided to take a look at what happens between sugars and amino acids in 1912 that the reaction was properly documented. When Maillard went off to fight in World War I, American chemist John Hodge took up the torch a few decades later and published a paper in 1953 detailing the ins and outs of the reaction, and there we are. Brace yourself: Wagyu is prime for delivering on the Maillard reaction, especially the affordable and versatile Wagyu chuck steak. There are a few things to keep in mind before you get started, specifically about salting, drying, and oiling your steak. You want your meat to be as dry as possible for the Maillard reaction to work, so consider salting your steak at least an hour before cooking to dry it out. Why? If your steak has too much moisture, you’ll essentially be steaming it, not grilling or frying it. Also, the wetter it is, the longer it’ll take to get that delicious crust—and it’s possible the Maillard reaction won’t happen at all. The bonus is that you’ll also be properly seasoning your meat, too. If you’re short on time, you can use the paper towel method for pulling out the moisture, but good things come to those who wait—so we suggest sticking with the salt. We also highly recommend getting into the habit of making sure your meat hits room temperature for more even cooking, so take your steak out of the fridge for at least 30 minutes before cooking. Although you can get the Maillard reaction without it, oil not only prevents your steak from sticking, but it also helps your meat cook better. Because oil is a better conductor of heat than air, it fills in the miniscule air gaps between a hot pan or hot grill grates and your steak so you get that crispy brown crust on every last millimeter of meat. Opt for canola oil, cooking butter, or olive oil, and never, ever use EVOO to cook your steak because it’s not cut out for the heat needed to sear a steak. Although some steak aficionados say the ideal searing temperature for the Maillard reaction is around a call-the-fire-department 400-450°F (204-232°C), we take a different approach. Grab a cast-iron skillet (or any heavy pan) on medium heat (roughly 335°F) for two minutes. Season your steak with a bit more salt and pepper, add 2 tablespoons of oil, and gently place your Wagyu steak in the pan. Walk away—yes, leave the room and resist the temptation to touch the meat—for three whole minutes. 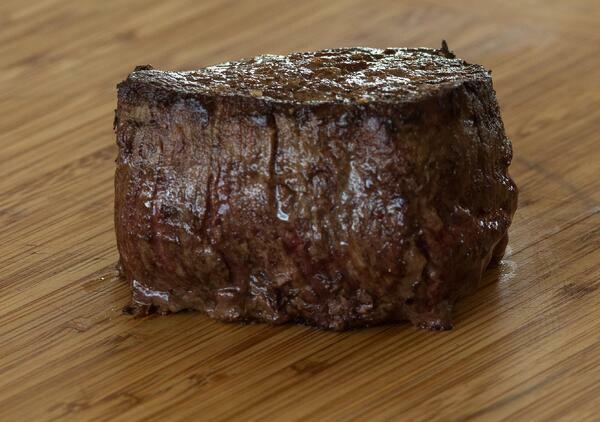 Flip the steak and walk away, again, for three more minutes. Flip the steak again, this time for two minutes. Last time: Flip the steak and let it sit for two final minutes. Turn off the heat, remove the steak from the skillet, and rest it for five minutes. If you’re doubtful because the recipe doesn’t call for you to sear your beef at a super-high heat, just try it. The problem with a super-hot, glowing-red pan is that the inside of your steak is going to cook too hot too fast, and you’ll end up with disappointing gray steak—even if the outside of your meat looks awesome. If you opt to grill your steak, it’s a great way to see the Maillard reaction in action, too, and it happens at that high heat you’d expect. Whether you prefer gas or charcoal, the heat on your grill will be high enough for the Maillard reaction, resulting in a flavor-filled crust. Season some Wagyu tri tip roast. Sear each side for a minute or two until it’s brown and crispy. Move the steaks to a lower heat and cook for roughly five more minutes. Take the steaks off the heat and rest for five minutes. And with that, you’re ready to pay homage to Louis-Camille Maillard. Bon appetit! With just a little bit of extra time and care, you can maximize the flavor and texture of your Wagyu. Here are five pro tips for making sure you’re cooking Wagyu like the pros. Sous vide meatballs require some keen attention to detail—these won’t cook the same as pan-seared, slow-cooked, or baked meatballs. Keep these three things in mind as you embark on your sous vide meatball journey.